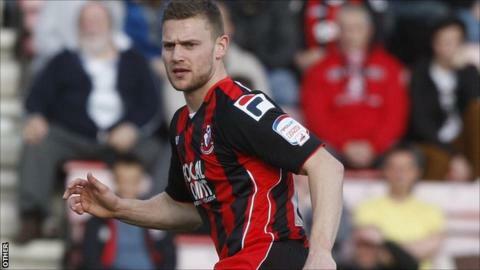 Bournemouth defender Simon Francis says their run-in to the end of the season should provide them with the points they need to earn promotion. The Cherries are out of the play-off places after three straight defeats. However, they will play eight of their 11 remaining fixtures against sides currently in the lower half of the League One table. "They are all winnable games, we've got 11 games and we think we can win them all," Francis told BBC Radio Solent. "If you look at our remaining fixtures, yes, we have lost our last three, but if you look at the positives we are playing teams in the bottom half of the table. "That is not us being confident or cocky, it is us being positive." Bournemouth have not scored in their last three games, a run that has seen them drop from first to seventh. Francis admitted their latest defeat against Coventry on Tuesday was a crushing blow and gives added significance to this weekend's fixture at Leyton Orient. "I'm pretty lost for words," added Francis. "Three games, three defeats, no goals, it's pretty hard to take. "We've got to try and stop the rot, otherwise we are going to find ourselves out of the play-offs and trying to chase teams. It's up to us to turn it around. "We weren't clinical or ruthless enough and got caught with a sucker punch. "Hopefully, this our blip and we can start again on Saturday and turn things around. It's the tightest the league's ever been and that's gone in our favour."